When one doesnae live in a climate that is warm and sunny most of the time, the rare days when the Sun does make an appearance are relished with much more vigor. Ross came and called for me at mid day and we headed into town. I had left my drums in The Jazz Bar, earlier on that morning. So that was our next port of call. After I had retrieved my kit, I headed to the Assembly press office to arrange my review for The Tshwane Gospal Choir at 5.30pm. We then Headed to The Meadows for a bit of sunbathing, handstands, drumming and gong playing with a selection of friends of a healing persuasion. It was a delightful afternoon. Setting the tone perfectly for my 5,30pm Mumble review mission. It was the night before at The Anti Poet Gig that this troupe of lovely, lovely artists walked into the Divine heart. So I already knew what a treat for the senses this was going to be. I took my seat in the theater as the very handsome backing band wove beautiful ambient music before show time. This is a performance that is a joy from start to finish. The Choir serenaded us with beautiful South African Indigenous folk songs, that spoke of the troubled years of apartheid. The tears were welling up inside me, I was holding them back because my mascara wasnae waterproof. I call this my Soul Gage. Whenever I hear perfect examples of Gospel music that comes from a genuine place of Holy Divinity. The power of the muse always reaches into my soul. Everything about this performance is excellent, captivating and thoroughly entertaining. 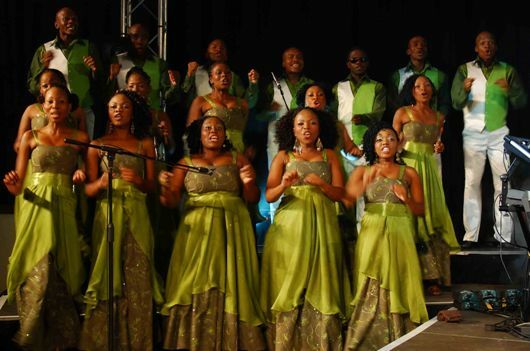 The Tshwane Gospel Choir are Angels on a mission and have traveled a long long way to bring this Holy experience to our attention and delight. Everyone was wanting to dance too and by the last number, the whole of the Audience joined the troupe on stage to cut a rug. This is a deserved 5 Star performance. This show will enrich your life!